Who doesn't love a rustic beam (or 10!)? It's the classic way to make a room feel intimate, give it architectural interest, or even hide some structural stuff if you're opening up walls and need reinforcement. Living in a more modern space? Maybe you want to go a little sleek instead of rustic. Keep in mind that beams today don't have to be pricy. Finding reclaimed beams - inexpensive reclaimed beams, for that matter - you can reuse is the dream of many. But when that's not a reality, or when the size and weight of the beams is a concern, "faux" beams may be the answer. Faux beams look like the real thing but are hollow, allowing them to be much easier to install and, often, more affordable. The right hue up above can take a good space and make it amazing. This dreamy sea blue makes walking down the hall a pleasure, but with so much allure in what could just be a "pass-through," you might actually want to have a seat and stay awhile. In a large space without a lot of architectural detail, moldings on the ceiling can create just the right amount of interest. 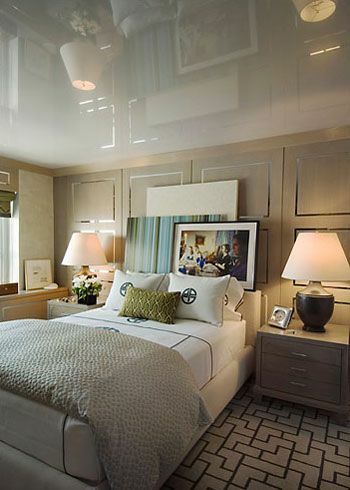 You don't need a Parisian pied-à-terre to create historic-feeling character in your home. 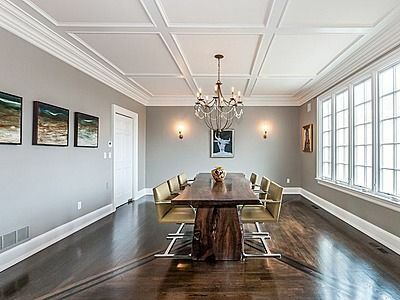 A medallion and some intricate moldings on the ceiling can transform a room. You can find vintage medallions at architectural salvage stores, and a variety of newer versions at Lowe's. Or, use a stencil and some metallic paint to create a one-of-a-kind ceiling, like this one from Apartment Therapy. Wallpaper on the ceiling? It's the perfect accent for this sweet New York nursery. You may not be up to recreating the Sistine Chapel a la Michelangelo, but you may be able to reference another masterpiece. 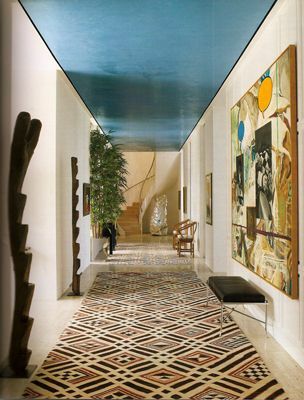 This ceiling in a London townhouse looks like a Mondrian come to life. 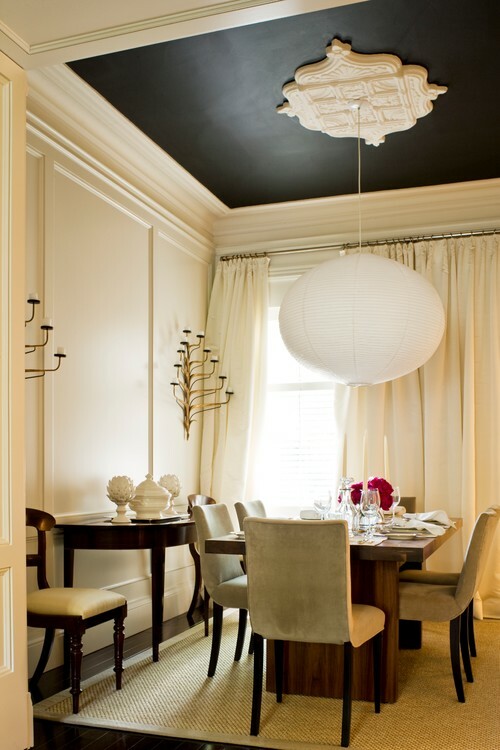 "To make this dining room comfortable and intimate, the designer painted the ceiling black and added a very low paper lantern," said Build Direct. 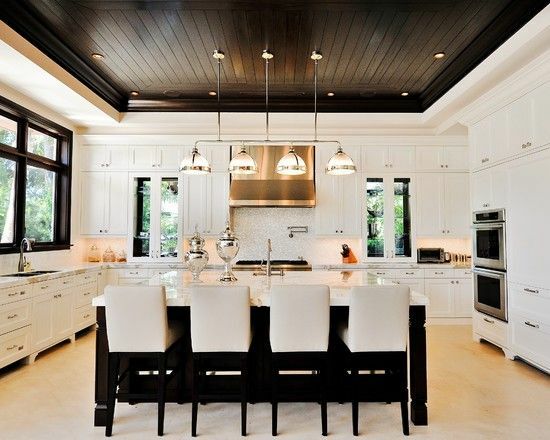 "Large, open spaces can also benefit from a dark ceiling if you want to make it look a little more defined." Keeping the ceiling white in this chic kitchen could go a little country (paging Joanna Gaines with that shiplap look! ), but painting it black creates contrast and drama, while showcasing the high-end features. Graphic patterns have invaded pretty much every other surface, and now it's time to look up to them. This office/homework space benefits from the patterned ceiling, which adds even more interest and vibrancy to a space that could be dull or clinical. Who says the "work" space has to be boring?! This glossy finish is a much more sophisticated way of creating a reflective surface on the ceiling that gives the room a touch of class and loads of interest while keeping everything sleek and inviting.